The unveiling of the CRV's mini me, Honda HRV to North America created much buzz as this vehicle has been around in Asia-Pacific markets since 1999. The 2016 model was released in the US in 2015. 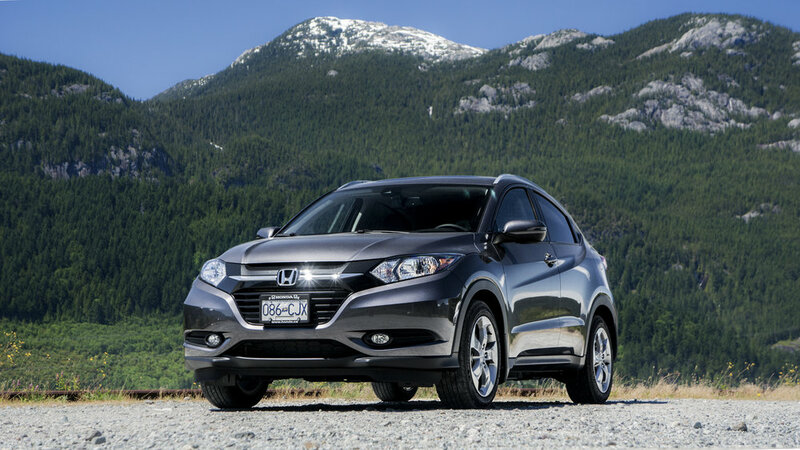 The HRV is a more compact version of it's larger cousin. It looks hip, has a generous amount of smart features, and spacious for a compact SUV in this price range. Disclosure: Honda Canada provided me with the 2017 HR-V EXL for a week to test drive, and photograph. Braking time was impressive. The light weight body really improved the braking performance. Fuel economy is excellent because of the CVT engine. Speedometer ring turns green when you're driving efficiently. It turns white when burning too much gas. Exterior is attractive to me. The concealed rear door handles give it a sleek & modern look. One thing to note is the front head beams are halogen lights for North America but Europe gets LED. The back lights are LED and wrap around the sides. It's about 9 inches longer than a Honda Fit and 9 inches shorter than a Honda CRV. Although the car has a very Honda look. I do feel it is taking outdated design cues. The rear lights look like 2008 Civic Coupe, and the front kinda looks like a cross from the "space ship" looking Civic and Fit. I still find the exterior style looks very hip and doesn't feel over styled. USB & HDMI ports are awkwardly located under the middle stick. 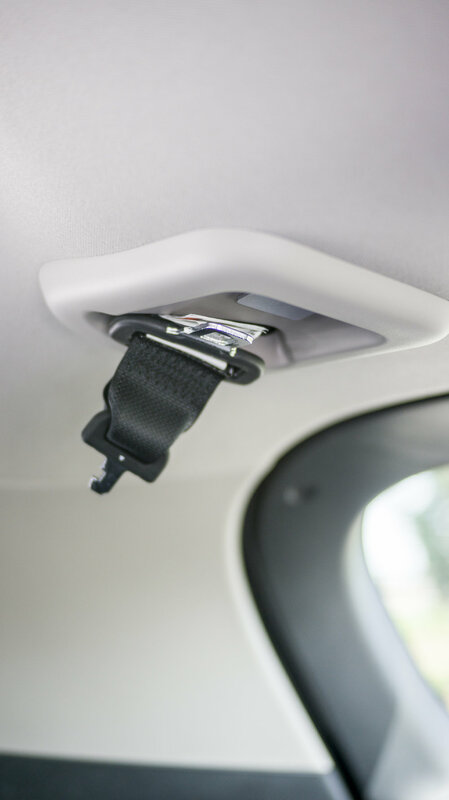 Rear seats flip up like the Fit so you can store tall items in the middle of the car. Rear seats also flip down to be flush with the trunk to maximize cargo space. Front passenger seat can completely re-cline the seat flat and Honda claims you can fit a surf board in this mode. Massive cargo area for a car this small. Looks like the current infotainment system in the Civic but it's using the older generation. It does not support Android Auto or Apple Car play. It has built in navigation system in our model but it doesn't work anywhere as well as google maps. It doesn't read out the street names. As an example of what it will say to the driver, "600 m turn right" I often found myself having to look at the screen to see the street name. Blind spot camera on the passenger side mirror. It activates when signalling right. There is no camera installed on the driver side when signalling left. Interesting this vehicle has paddles to shift the gear! 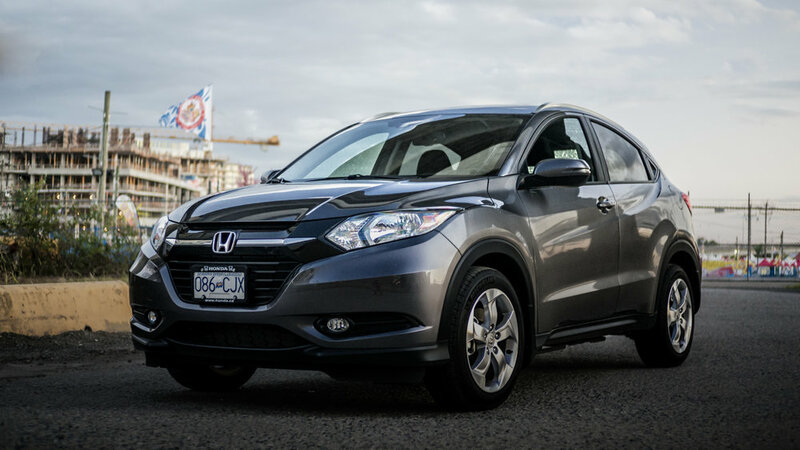 Honda HRV may not be the fastest vehicle in it's category but it makes up for that with the modern interior design, excellent fuel economy, sporty handling, driver experience, generous storage space, handsome exterior and aggressive pricing. It is a good choice for those looking for a family oriented vehicle with the feel good factor. Personally I am not ready for the dad van look. The HRV's compact size and surprisingly roomy interior makes it a great choice for those who drive in tight city conditions often or looking for a small and efficient crossover. It's a practical vehicle for normal driving. It's compact body doesn't make it annoying to drive and park in tight spaces. If acceleration isn't a deal breaker and you like a firmer suspension plus responsive steering like me than the HRV could be good bang for buck starting at $21,150. I love almost every detail about a vehicle in this price range but the main thing holding me back from buying right now is the button and knob less dashboard interface. It makes it dangerous to change the volume, climate, etc while driving. I would like to see next years model include the dashboard changes they did to the CRV to re-incorporate the knobs and buttons to the dash. The second thing on the wish list from Honda is to have an option to beef up the engine to with another 25-30 HP. I would be willing to sacrifice some fuel efficiency to get a bit more of a boost. Regardless of the cons the HRV is high on my list as a potential future car when our home is ready. I will be testing out the Honda CRV next which has 49 HP more than the HRV. Will the beefier engine in the CRV win me over? Or will the larger size vehicle be so painful to park and drive downtown that I make a compromise with a slower acceleration and go with the HRV? Wait till next week to find out!